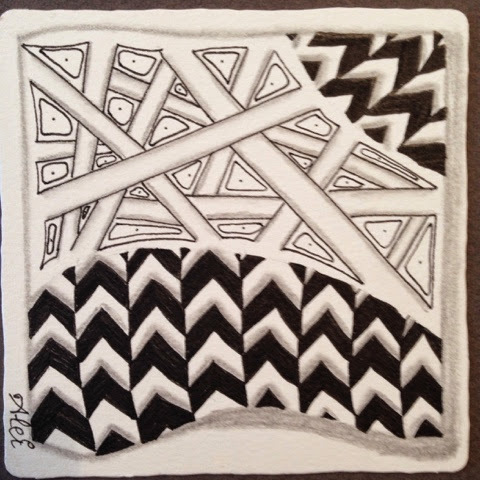 Last saterday I followed a basic zentangle course together with Ingrid and Ulla at CZT Rita Nikolajeva in Brussels. It was such a nice experience ! 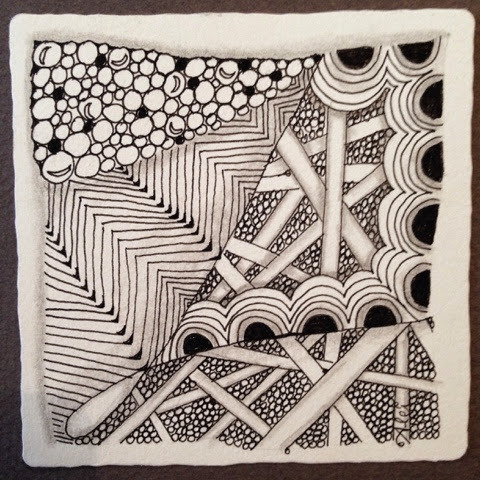 I only practice zentangle for a few months, and I wanted to know more about the philosophy, the real materials used to zentangle etc. I surely can advice a course of Rita to you. 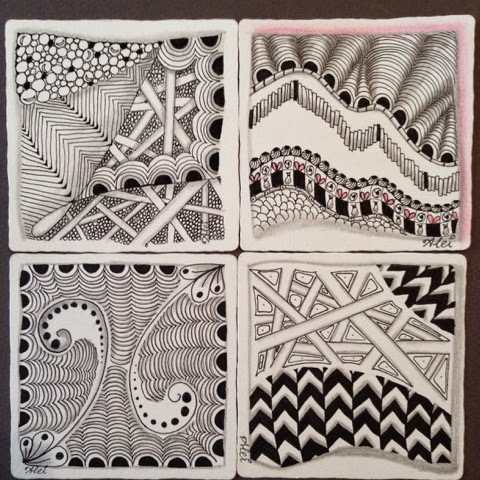 You can look at her website dotslinespatterns.com for different workshops she gives. We learned some basic patterns like Tipple, Crescent Moon, Hollibough and Static and I decided to make a little series of them - just for practice . 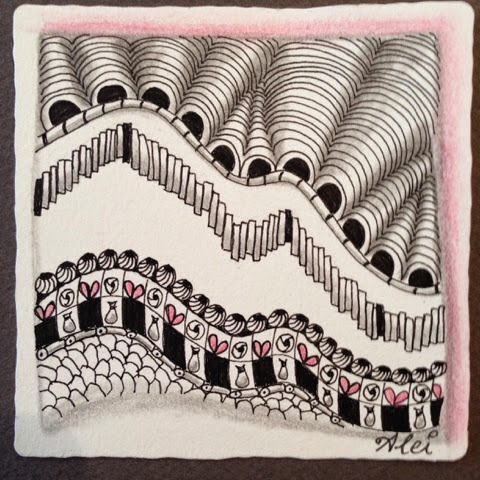 One of my tiles is also for Laura, who set the Diva challenge #190 to use pink this week for her grandmother who passed a way a year ago of brest cancer. As I know very little about colouring and have no special material for it, I just took a pencil of my chilren and coloured the bow of my 'cookie boxes' I put into my tile. It reminds me of the cookie box I brought to the worskhop last week - it was on my birthday- but also because cookie boxes remind me to my own grandmother. Laura, may be your grandmother liked nice cookie boxes too ! 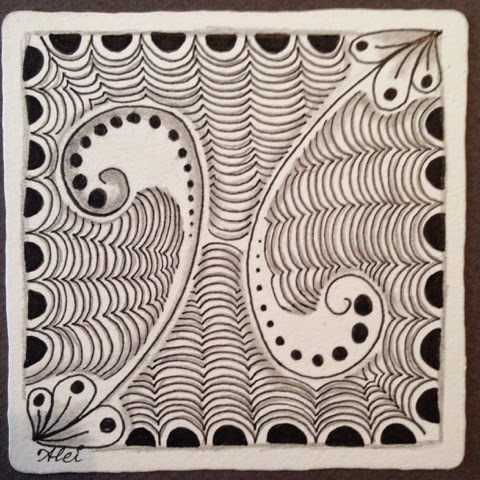 And the pattern you can see in my last tile, is one of my daughter. She showed it to me yesterday and she calles it 'Sixties'. 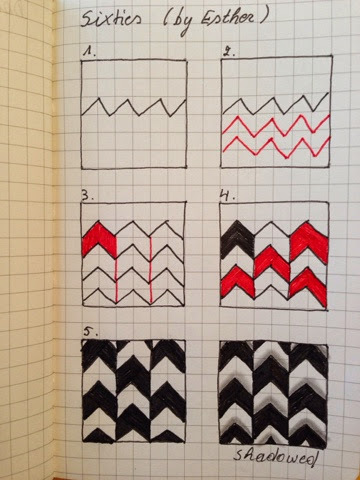 I give you also the steps for this pattern. May be this pattern already exists, but nevermind, at the moment we call it like this. Fijn dat je een workshop hebt gedaan en dat het zo goed bevallen is! Je tiles zijn mooi en de kleur is prima in die tile. Great bunch of tile and I love the subtle addition of your pink!